Bajaj Auto has announced a new tagline for its flagship motorcycle, the Dominar 400. The company has dropped the “Hyperriding” tag line in favour of a new “Don’t Hold Back” tagline. It had opted for several tag lines in the past, the most famous of which was the “Haathi Mat Paalo” that took a dig at the Royal Enfield range of motorcycles. The new promotional poster shows the Auroral Green Bajaj Dominar 400 with Polar Lights in the backdrop. Apart from Auroral Green, the 2019 Bajaj Dominar 400 can be purchased in Vine Black colour option. 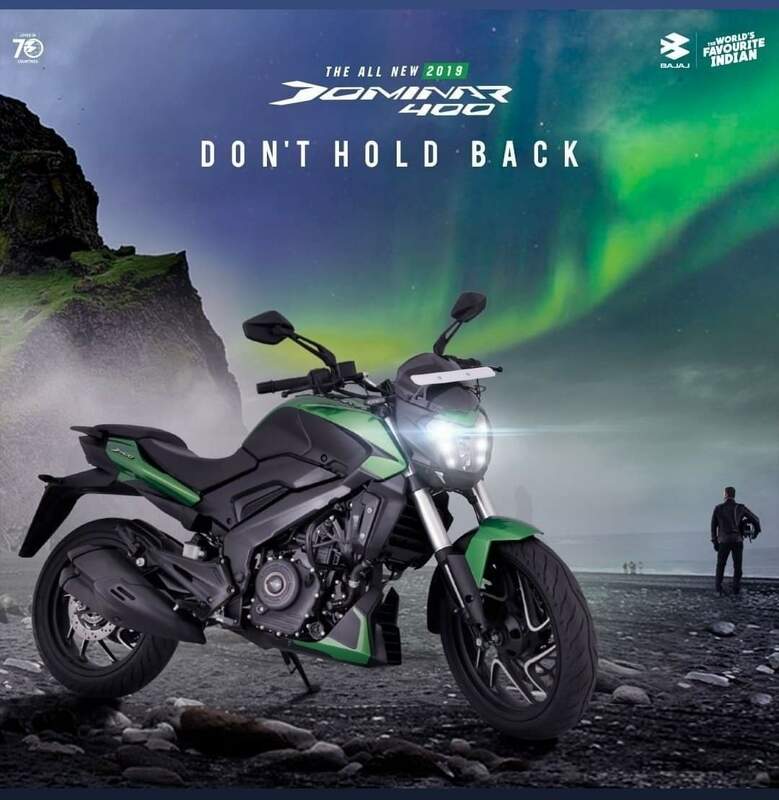 The latest promotional image of the 2019 Bajaj Dominar 400 Facebook shows it in the new colour option, Auroral Green, with polar lights (also called Aurora) in the background. Apart from Auroral Green, the 2019 Dominar 400 can also be purchased in Vine Black. 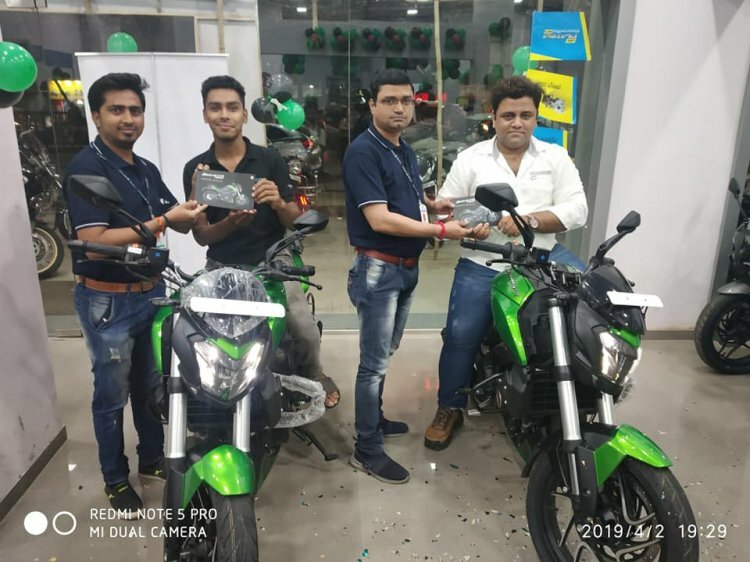 Bajaj Auto launched the 2019 Dominar 400 in the Indian market on 4 April 2019. The motorcycle was launched at INR 1,73,870 (ex-showroom Delhi), INR 10,795 higher than the old model but lower than what most had expected (INR 1.80 lakh). The price increase is an effect of upgraded hardware and performance increase that the 2019 model packs. The USD telescopic forks have replaced the conventional telescopic units. The improved setup gives the motorcycle a beefier look. Regular followers would remember that the CS400 concept was equipped with upside-down forks although the configuration was dropped to keep prices competitive and compete effectively against the Royal Enfield 350 range. Mechanical specifications have also been revised, and although the Dominar 400 continues to use a 373.2 cc, single-cylinder, liquid-cooled engine with three spark plugs, the performance numbers have witnessed an increase. The 2019 model's engine comes with a dual overhead camshaft and a revised engine map with which it now delivers 40 PS of power (+5 PS) at 8,650 rpm and 35 Nm of peak torque at 7,000 rpm. The performance upgrade has resulted in an improved power-to-weight ratio (from 192 PS/Ton to 217 PS/Ton) and a higher top speed of 156 km/h (vs. 148 km/h previously). The 2019 Bajaj Dominar 400 has been launched in India at INR 1,73,870 (ex-showroom Delhi) and its deliveries have commenced. Other improvements brought to the Bajaj Dominar 400 with the MY2019 update include new twin barrel exhaust design, revised instrument console setup and radial front callipers. The 2019 model features a new and improved forged steel side stand, new mirror design with cast aluminium stalks, bungee straps under the pillion seat and spacecraft inspired tank pad decals as well.